BERLIN - Steve Baleshiski has withdrawn his candidacy as the GOP candidate challenging Democratic House Speaker Joe Aresimowicz for the 30th House District Seat. "I entered politics because of my deep concern about the direction of our great state and country. In my anguish and anger regarding several highly charged politicaly divided topics facing our state and our nation, I have used strong and inappropriate language. To Those who were hurt by my hars words, I want to say that I am truly sorry. "I have learned a great deal from this experience and I will no longer speak in a way that hurts or offends people. That was never my intention and I do not want these brash comments to define me as a person. I regret the pain that I have caused by my words. "I alone am responsible for my mitakes and not my party or the fine people who have supported me. I have decided to resign my candidacy effective immediately for the 30th District House of Rrepresentatives." In a joint statement sent by email, Kalkowski and Anne Reilly, chairman of the Berlin Republican Town Committees, respectively, told The Herald last night that Baleshiski’s withdrawal was effective immediately. “We had given Mr. Baleshiski time to reflect on his use of extremely inappropriate language regarding several highly charged politically divided topics facing our state and nation, as well as to confer with his family and friends regarding his decision,” the statement read. 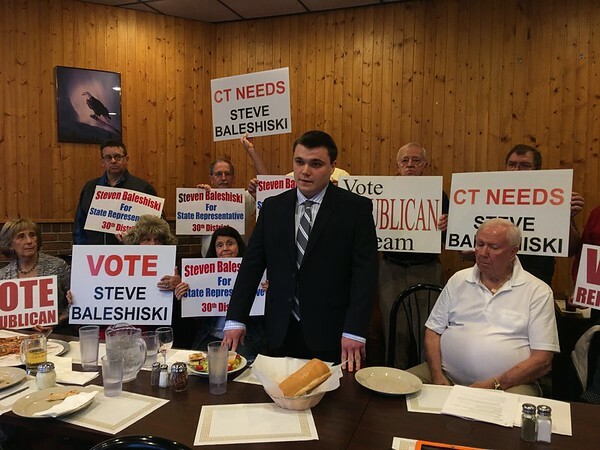 “The Southington and Berlin Republican Town Committees do not, and will never, condone this hurtful and dividing behavior and therefore, we had withdrawn our endorsement of Mr. Baleshiski prior to his resignation. The 30th District covers most of Berlin and parts of Southington. Kalkowski said Friday morning "we have at least one potential candidate that we are lining up" to run in place of Baleshiski and "will know shortly." The statements came after a rally was held Thursday night condemning the “hatred” in Baleshiski’s personal Facebook posts after the posts were disclosed by The Herald last week. The Connecticut Education Association condemned the "hate" speech and a Berlin elected official called for Baleshiski's withdrawal following the disclosure of the posts. Baleshiski told The Herald that he didn’t like people who use tragedies to take away rights from Americans, that he is a devout Christian and doesn’t want to be led astray, and that he wanted to dispel the notion that all supporters of President Donald Trump are racist. Minutes before the Thursday rally’s start, Rachel Rochette, a former mayor and town councilor in Berlin, shared with The Herald what she showed were tweets by Baleshiski of a similar nature to the Facebook posts, made as recently as earlier this month. Posted in The Bristol Press, , Bristol, Southington Herald on Thursday, 11 October 2018 22:19. Updated: Friday, 12 October 2018 10:05.